After 3 months of using the Garmin Edge 510 cycle computer on both the Merida Scultura 5000 and the Dahon Boardwalk, I have had the chance to try out most of the features on the Garmin. With that, it is now possible to give a more detailed review about the Garmin Edge 510, and also introduce some of the more interesting features found on the Garmin. First of all, the interface of this Garmin allows it to be used on different bikes easily, even though the bikes may have different sensors or wheel sizes. This is achieved by allowing different bike profiles to be created to suit the different bikes. For example, the Merida is using 700C wheels with Schwalbe One 25C tires, with the Garmin GSC-10 ANT+ sensor installed on the bike. This sensor can track cadence and speed. 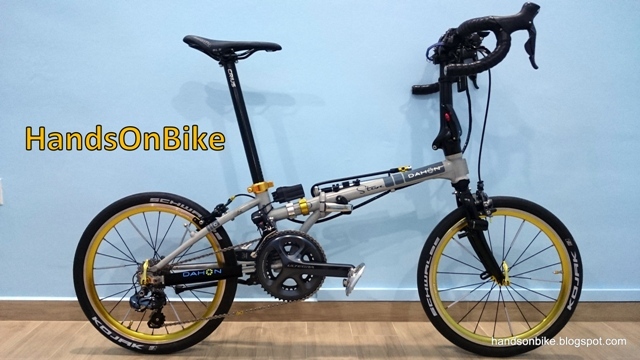 As for the Dahon Boardwalk, it is using 20" wheels with Schwalbe Kojak tires. It has a new ANT+ Garmin speed sensor which does not require the use of a magnet on the spokes. Also, the Dahon Boardwalk has a Ultegra Di2 system, with a D-Fly wireless unit that enables gear data to be transmitted to and displayed on the Garmin Edge 510. Despite the different sensors and setups, this is not a problem for the Garmin, as it is fully customisable to be able to be used effectively on both the bikes. I have created different bike profiles to suit the two different bikes, as shown below. Also, different activity profiles can be created, which refers to the different data fields that will be displayed on screen. As long as the correct bike profile is chosen, it will detect the correct sensors and display the correct data. This setup only needs to be done once, as the linking of the ANT+ sensors to the Garmin is automatically done for subsequent usage. Choosing the different activity profile will then display different data fields on the screen. Four different activity profiles and two different bike profiles, all nicely colour coded for easy identification. The Merida is linked to the GSC-10 Garmin sensor, which has speed and cadence data as shown here. For the Merida Race profile, these are the info that I chose to display on the first page. First page of the Merida Commute Mode, shown here in blue colour. Time of Day is important, while Heart Rate is not important while commuting. First page of the Dahon Commute activity profile. 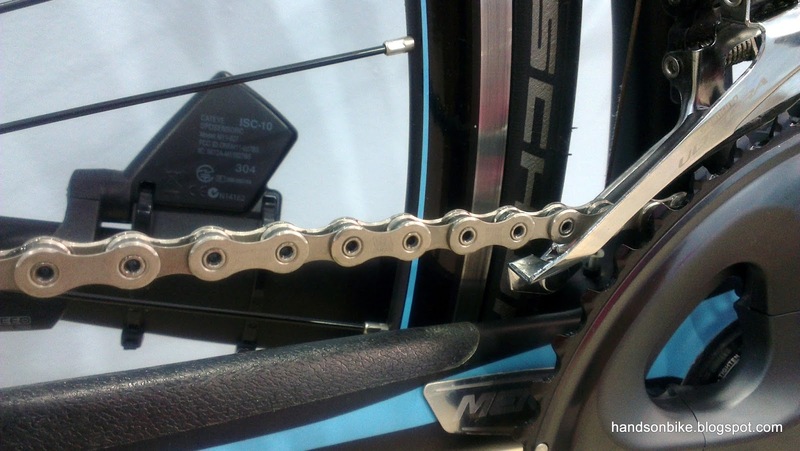 Di2 gears are clearly shown at the top of the screen. Also, shown here is the Night display mode, with a black background and lighted words. Second page of the Dahon Commute profile. Di2 battery level is also shown here. This is the Day display mode, with a white background and black words for contrast under sunlight. The data fields for each page is also fully customisable. Besides being able to choose the number of pages to display, the number of data fields to display on each page and the type of data to display can also be chosen. Up to 10 data fields can be displayed on one page. However, displaying less data fields per page will allow each data field to be larger. With only 5 data fields on this page, the size of each field can be larger. For every data field box shown on screen, it can be changed to display the data that you want. Shown here are just three pages out of about six pages. More categories for those who love cycling data. Under each main category are more sub-categories. I think that the Bike Profile and Activity Profile arrangement works really well, as this allows the Garmin to be used across different bikes, while still allowing full customisation of the sensors and data display to best match each bike and type of usage. 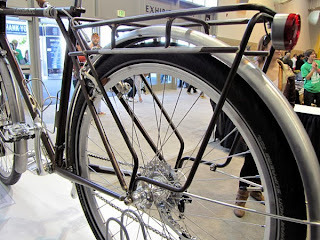 It is easy to expand this to more bikes if desired. There are also some other rather special features, such as Training Partner or Ride A Course. These can add a bit of excitement to an otherwise boring solo ride. For Training Partner, what it does is to let you choose a previously ridden course, and then assign a virtual rider to pace you. For those who have played racing games before, this is similar to the Ghost Car mode, with a virtual car driving alongside you. In this case, you first choose the course to ride, and then adjust the speed of the training partner. The distance and time difference will then be displayed. This mode is useful if you want to compare your average speed to the pre-set value. It encourages you to ride faster and put more distance between yourself and your virtual partner. The speed of the virtual partner can also be changed on the go, so you can increase the speed of your virtual partner if you find that you are pulling too far ahead, or vice versa. Select the speed of your training partner, and start riding! The distance and time difference will then be displayed, to see how you match up against the selected speed. Another feature is the Ride A Course mode. This allows you to retrace a previously ridden route, and show you how far you are along the route. If you go off course, it will also inform you. A selection of two different courses that I have saved and named. Rough map of the course. When activated, it will also show how far along the route you are. The next major feature is LiveTracking, which allows your current location to be broadcast to selected viewers. Other than your location, selected parameters such as speed, distance, heart rate and etc can be seen by your selected viewers. For this to work, the Garmin will need to be linked to your smartphone via Bluetooth. The data will then be transmitted from the Garmin to the smartphone, and then uploaded from the smartphone to the Internet. 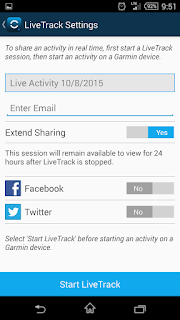 The Garmin Connect app will need to be downloaded on the smartphone. Example of a ride that was tracked using LiveTracking. The default ride name is Johor Bahru Cycling, which is a bug with Garmin that has not been fixed yet. To start LiveTracking, the ride needs to be first started on the Garmin. Then, you can send invitation emails (with the link to the ride map) to your selected viewers, or just upload it to Facebook or Twitter. 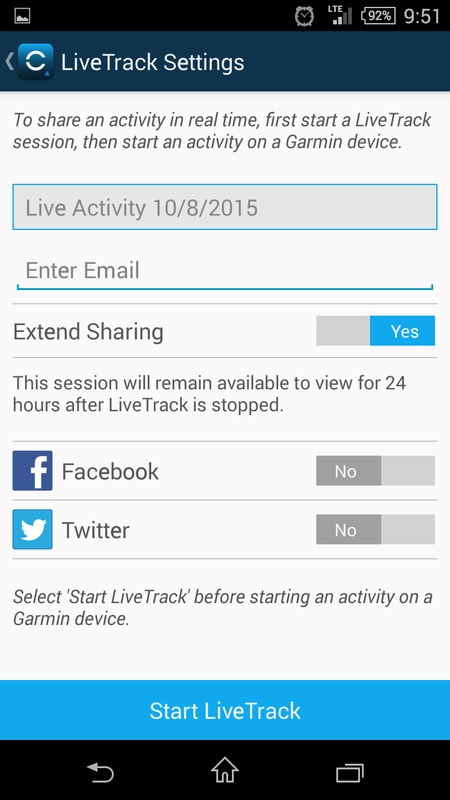 After that, start LiveTrack on the phone and the ride will be live! This is a fun feature that is useful if you want to let others know your location, or if you want to check where your friend is currently at. Not sure how much the lag is, but it is not too much to be unusable. Currently there is a bug with the automatic Facebook upload, which has not been fixed yet. There are other features such as Navigation and such which I have not tried, so there is still some hidden potential in the Garmin Edge 510. Nevertheless, it already has a lot of features packed into it, many of which are quite useful. Other than the features, here are some of my observations on the general function of the Garmin Edge 510. The first time I turned on the Garmin and tried to connect it to the GPS, it took more than five minutes before it was connected. The good news is, that was only for the first time. Subsequent locking of the GPS signal was very fast, taking less than thirty seconds, as long as you are in the open. If you are under shelter, it tends to take a while more, but still acceptable. Overall, connecting to the GPS is quick and reliable, so no problem there. The battery life of the Garmin is very good, as I can easily go more than two weeks before needing to charge it, despite using it for commuting to and from work a few days a week. I never had a problem with the Garmin running out of battery, so I am very pleased with the battery life, with respect to my type of usage. It is possible to use the Garmin Edge 510 on its own, without connecting to any ANT+ sensors. I did try this when I tested the Garmin on the Dahon MuEX, which does not have any ANT+ sensors on it. If there are no sensors, the Garmin will estimate the speed and distance based on GPS data. This is of course not as accurate as having sensors on the bike, but it is good enough for most purposes. The overall distance and average speed will be reasonably accurate, but not the current speed as it cannot respond quickly enough to changes. With that, my in depth review of the Garmin Edge 510 is complete! Definitely not as in depth as those by DC Rainmaker (which is super detailed), but probably useful enough to learn more about the Garmin. I think it is a good cycling computer, and is also a worthwhile investment if you have multiple bikes.